We’d love your help. Let us know what’s wrong with this preview of A Rainbow Above Us by Sharon Sala. Bowie James comes back to help repair his grandmother's house, but he doesn't intend to stay long. He and his mother were forced out of Blessings a decade ago What will it take to bring people together? To ask other readers questions about A Rainbow Above Us, please sign up. This new story from Blessing Georgia by Sharon Sala had me feeling good. This is Brodie and Rowan's story and it was delightfully sweet. So Brodie left Blessing when he was sixteen years old and never wanted to come back but his “girls” which is his aunt and grandma have asked him to help fix up their house that was completely damaged in the tornado storm in the previous book. Rowan has lost everything in the tornado and she had f I received a copy of this book from NetGalley for a honest review. Well first off, this is a great series and I love the little town, the townspeople and the sense of community. These books all have what I would call karma and redemption themes without cliché or cheesy- which I love. Bowie James is back in town after having left under horrendous circumstances. Bowie is immediately loveable. Coming in to help "his girls" displaced after the hurricane. His grandmother and aunt meet a sweet girl at the nursing home who also suffered tragedies thanks to the hurrican Well first off, this is a great series and I love the little town, the townspeople and the sense of community. These books all have what I would call karma and redemption themes without cliché or cheesy- which I love. Bowie James is back in town after having left under horrendous circumstances. Bowie is immediately loveable. Coming in to help "his girls" displaced after the hurricane. His grandmother and aunt meet a sweet girl at the nursing home who also suffered tragedies thanks to the hurricane and is need of rescue herself. Rowan is the isolated farm girl unaware of her sweetness and beauty. She was just the everyday sweetheart and I was anxious for she and Bowie to get together as a couple. The other happenings in town always lead to a very interesting and dynamic book when ready of Blessings, GA. The entire Boone family must face the sins of their past and the way they treated Bowie and his mama, Billie. Never fear that Sharon Sala won't give them their due- and then some. Redemption of one is usually at hand and I loved the person it fell to this book. 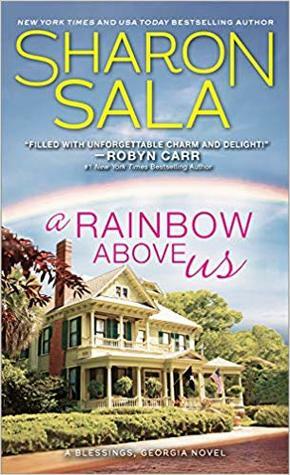 Sharon Sala brings us back to Blessings and all the familiar faces who live there. This time, we meet Bowie James returning to help his Aunt Ella and Grandmother Pearl after the devastation of Hurricane Fanny. Not long after his return, he receives a welcoming that most people would avoid from the people who ran him and his mother out. Still, he gets his family and Rowan Harper, the woman who sought shelter with them after losing everyone and everything, back to his trailer. Bowie and Rowan each Sharon Sala brings us back to Blessings and all the familiar faces who live there. This time, we meet Bowie James returning to help his Aunt Ella and Grandmother Pearl after the devastation of Hurricane Fanny. Not long after his return, he receives a welcoming that most people would avoid from the people who ran him and his mother out. Still, he gets his family and Rowan Harper, the woman who sought shelter with them after losing everyone and everything, back to his trailer. Bowie and Rowan each have a past that never truly goes away living in Blessings. But, they also have each other to lean on during the good and the bad. It is up to them to see if they can put the past behind them and become the people they want to be for each other. With the help of the townspeople and self reflection and growth, will they learn from the past to achieve a better future? Sharon Sala has brought us another family from Blessings. It was so nice to meet new people while catching up with the familiar. I really enjoyed seeing these two young people grow as their story progressed and how the past shaped not only them, but the people around them. Their story was sweet and warms the heart. I look forward to meeting more people from Blessings. After Hurricane Fanny devastated Blessings, Bowie returns to the town he swore to never visit again to hel his grandmother and aunt rebuild their home. His return churns so,e secrets with horrible consequences. ARC from NetGalley.